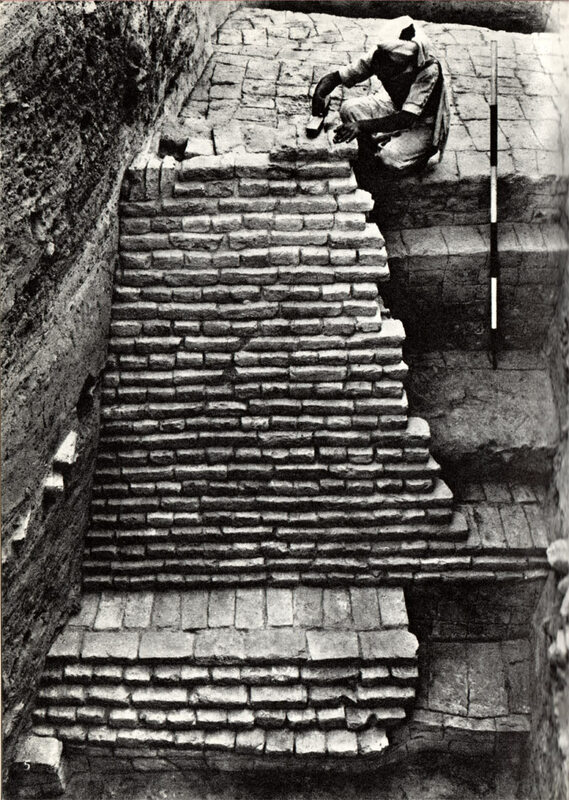 Sir Mortimer Wheeler, the excavator of the wall shown here, wrote that ". . . . both Harappa and Mohenjo-daro were dominated by am embattled acropolis or citadel, occupying a marginal block and built up with mud and mud-brick to a height of forty or fifty feet above the featureless lain with a revetment of backed brick. Upon this acropolis were ritual buildings and places of assembly. . .. From its acropolis one may suppose that each city was regarded by rulers who may on general probability had had priestly attributes but, as their well ordered towns and evolved dwellings imply, were essentially secular in outlook; sufficiently benevolent or farsighted, at the least, to nurture an uncommonly high general standard of living (large numbers of substantial court-yard houses imply a wide distribution of wealth and a prosperous middle class during the best period of Mohenjo-daro.) and at the same time sufficiently authoritative that this general standard was long maintained." Sir Mortimer Wheeler, From Early India and Pakistan to Ashoka, London, Thames and Hudson 1959, pp. 97-98.